James R: By now you've probably read a huge amount of praise for Mister Miracle series but I'm not looking to convince anyone still unconvinced by its greatness here. What I want to do is highlight one of the reasons the series worked so well for me - it's one of the most philosophically literate series I've ever read, and as a consequence, it shows just how mainstream comics can be refigured and reimagined if they are infused with intelligence, wit, and stylistic verve. 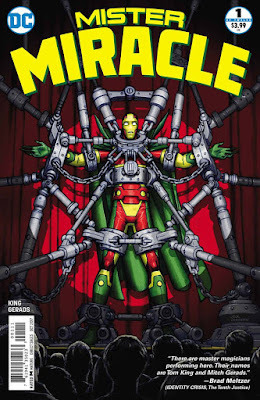 Mister Miracle came about when Dan DiDio at DC wisely offered Tom King the opportunity to write whatever he wanted as a limited series. His choice of Scott Free - the eponymous Mister Miracle - was an inspired one. Arguably the most recognisable of Jack Kirby's Fourth World creations, Mister Miracle has had philosophical overtones in each of his 21st century iterations. This is largely due to Grant Morrison's influence, as he was a central figure in the Scot's sprawling Seven Soldiers Of Victory project. That series also coincided with Jack Kirby's centenary, and certainly acts as a fitting salute to the King of Comics. 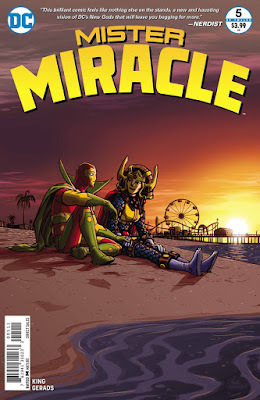 Mister Miracle feels like the spiritual sequel to Tom King's outstanding The Vision series for Marvel. In that title, we saw the Vision in a domestic setting, in an attempt to understand humanity. The series used Shakespeare's Merchant Of Venice as a device to reflect on that question too, and it worked remarkably well. Mister Miracle also focuses on the domestic life, but here the philosophical scope is larger still, and if I had to highlight the one recurring theme from the series, it is choice. More precisely, how do our choices define us, and how do we live with their consequences, both as humans, and as readers of the text. There are two issues in the series that brilliantly highlight this. The first comes in issue #5 as Scott Free spends what could be his last day on Earth before returning to New Genesis for execution. Should he stay with Big Barda or go back to face his end? It's a binary decision, and whilst we may never face decisions as fatal as Scott, we can all sympathise with a life-changing moment - when given an either/or choice, how do we act? Scott then reclines on the Californian sands with Big Barda and discusses René Descartes and the philosophical problem of doubt - namely that one can never fully escape the idea that your reality, and even your own self, may be an illusion. King brilliantly leaves this question unresolved in the issue, leaving it to the series finale to spring an escape worthy of Scott Free. Five issues later and we're presented with another philosophical problem, this time from the field of Ethics. Mister Miracle and Big Barda are told that to end the war between New Genesis and Darkseid they must sacrifice their son, Jacob. Once again, it becomes a matter of choice. Scott Free mulls the question over the course of the issue, and in doing so debates one of the central questions of Ethics - is it better to act for the greater good (the view of Utilitarianism) or should we stay principled and follow rules no matter the larger consequences (the Deontological view.) Unsurprisingly, Scott chooses to ignore the utilitarian advice solicited from the shop worker he talks to, and opts to save his child. King leaves the finest choice for last though. In the finale, published last week, Tom King and Mitch Gerads suggest that the whole series has been a fantasy. 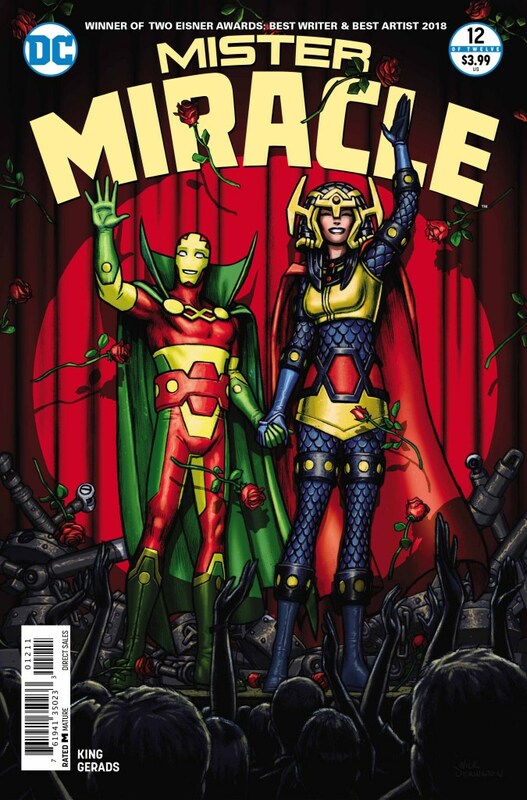 Think back to issue #5 and Descartes' doubt, and that Mister Miracle died in the first issue. We've been witnesses to Scott's imagination trapped in an afterlife. As Granny Goodness says to him "The deaths, the war, the wife, the child, this pretend life you... It's in your head. You're insane. You're making it up." What follows is Scott's consideration of this question - is this reality? Heaven? Hell? The joy of this series is, it's entirely up to you. I've already read a few reviews of the last issue which definitively state both 'he's dead' and 'he's alive' but, for me, there is no definite answer. I started this article with a quote from the philosopher Søren Kierkegaard. It was his belief that ultimately life was all about our choices; the affirmations and denials, the acceptances and rejections. Our choices define us. 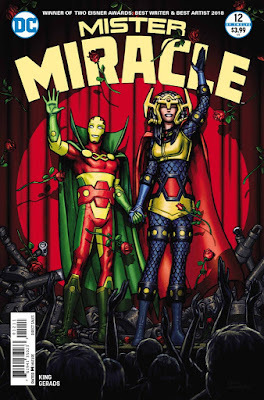 All the way through this series, Scott Free has faced choices, and, in the final issue, it's suggested that it will be up to him to chose between life and death, the domestic family life he's forged with Barda, or a life as the hero Mister Miracle. King leaves us with a final either/or statement. Scott States "I can always escape" to which Barda asks "Can you?" If he does, or if he doesn't, if he's dead or alive - that is up to us. To be alive is to choose, and no matter how dark the world may be, King's story tells us that we all have the power to choose. We are told in issue #1 that the fearful Anti-life Equation has the ability to "Change reality... To change men's minds." This is the threat of the series; the notion of losing the ability to freely choose. Who better to illustrate this than a man whose name is Free? It is, in every way, a remarkable book. It's a series that immediately demands re-reading and closer scrutiny, whilst being a funny and heartwarming story. Looking back through these issues, I noted that one that features an accurate discussion of an Enlightenment philosopher also carries an advertisement for a Batman/Teenage Mutant Ninja Turtles crossover - and that's the insane joy of comics. It's often said that the 1980s marked the last great era for mainstream comics, but Mister Miracle is one of many superb series that belie this view. It's a series that fuses so many ideas - Kirby's Fourth World creations, the domestic life of a hero, and the philosophical ideas highlighted above - and tie them together in a book that is going to be celebrated for a long time to come. Bravo Tom King and Mitch Gerads! I can't wait to see what they plan for their next trick.